The most fun Nintendo DS games, reviews, hardware and accessories! Nintendo DS - We love it! The Nintendo DS is a worldwide phenomenon! What makes this little games machine so great is its huge games library, which contains games that appeal to men, women, boys and girls of all ages. No longer are video games exclusively the realm of boys and big kids who want to play toy soldiers. 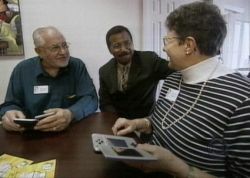 Thanks to the innovative DS, thousands of people every day are discovering new games that appeal to them, even if they had never played video games before. It's no surprise the little hand-held wonder keeps flying off the store shelves! At Lets-Play-DS.com we love the DS. I personally own two DS consoles (hey, you never know when you might need a spare) and most of my family and friends now own one too, thanks to my recommendation! On this site I'll share with you my passion for Nintendo's superb hand-held console. I'll tell you about the games that I enjoyed, as well as the titles that appealed to my family and friends. I'll also share game playing tips and information on how to care for your console, show how Mum and Dad can take on the children using DS's wireless multi-player games and explore the devices internet connectivity. Whether you've owned your DS since the day of release, or your still considering buying one for yourself, your partner or a child, you've come to the right place. So sit back and enjoy as we explore the world of Nintendo DS software and hardware together. Subscribe to the Lets-Play-DS.com DS players blog to be kept up-to-date with the latest reviews, news and features on our site. Keep up to date with the latest goings on in the world of the Nintendo DS with our Nintendo DS news pages. What is the Nintendo DSi? Find out just what makes this new version of the Nintendo DS so special. Choose your perfect Nintendo DS case with our handy guide. Keep your portable console safe and sound when you're on the road. 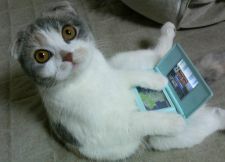 Looking for the most fun animal games and pet games on your Nintendo DS? Our new guide will show you the best out of the litter! Exercise your brain with your Nintendo DS! Exercise your brain and stimulate those grey cells with our guide to brain training games on the Nintendo DS. Get creative in the kitchen with your DS and a range of new interactive cookbooks. Ubisoft's Imagine Games for girls, what are they? Are they worth your money? Ubisoft's Imagine Games are targeted specifically at pre-teen girls, but are they worth anyone's time and money? Get your high octane thrills with your DS console and our selection of DS racing games! Adventure, excitement, pitfalls and perils! All this and more in our new Nintendo DS RPG (role playing games) guide. Save the universe on your Nintendo DS with our guide to the best shoot em up games! Lets-Play-DS.com - Who we are and what we do! Would you like to share your story about playing DS? Great, find out how you can submit your story or tip here.